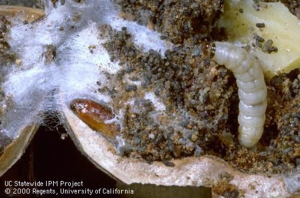 Navel orangeworm (NOW) can be a significant pest for many walnut producers in the Sacramento Valley, particularly late in the season as harvest approaches. Although 2016 has shaped up to be a lower pressure year for NOW in many locations compared to 2015, keep your eye on this pest. Degree-day model predictions from local almond orchards indicate that a fourth NOW flight is expected to occur when many walnut varieties are at their peak susceptibility. In a year when crop value has declined, ensuring high quality nuts is critical. Frass and webbing are associated with navel orangeworm infestation in walnuts. What is the historical NOW pressure in the orchard or block? How much in-orchard carry-over potential was there from 2015? How much damage from other sources exists in the orchard (codling moth, blight, sunburn, mechanical damage)? Overwintering and early NOW generations survive in mummies and damaged nuts prior to infesting in-season nuts. What is the proximity to external sources of NOW? NOW is considered a strong flier and can develop in a number of fruit and nut hosts, both agricultural and non-agricultural. Trap numbers and observations of egg-laying or infestation of early splits, damaged nuts, ground nuts, and mummies. Unless otherwise damaged, in-season nuts become susceptible to NOW infestation after hullsplit. The longer susceptible nuts are left on trees, the more vulnerable they are to NOW damage. In orchards where ethephon is applied to advance hullsplit and harvest, advantages may be gained by minimizing the time vulnerable nuts remain on trees. It is important to remember, however, that many of the materials available do not translocate in the plant tissue. Therefore, as hulls continue to split, newly exposed tissues may not be protected from earlier treatments or those applied with ethephon sprays. Many aspects of monitoring, best treatment materials, and application timing for NOW in walnuts are still being investigated. Results from these studies will be shared as they become available. More information on NOW management in walnuts is available here and on the UC IPM Guidelines.